MAXIM® PLATINUM® is the world’s first climbing rope with a permanent connection between core and cover. This feature as well as a braided middle marking and the unique Warning Track tracer system offer increased safety in every use. MAXIM® PLATINUM® is perfectly well suited for projecting, multi-pitch climbing, big wall climbing and ice climbing. 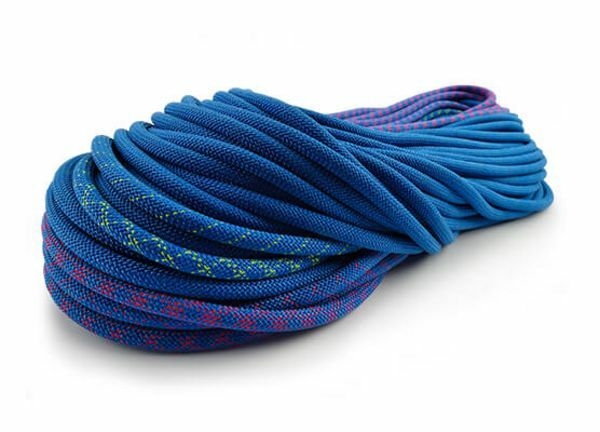 MAXIM Climbing ropes is proud to introduce MAXIM® PLATINUM®, the world's first dynamic climbing rope with a permanent connection between the core and the cover. With the PLATINUM® technology we weave the sheath between the core yarns at fixed intervals. This eliminates sheath slippage and creates an unparalleled level of safety, durability and redundancy. It is perfectly suited for developing routes, multi-pitch and big wall climbing as well as ice climbing. MAXIM® PLATINUM® has a soft hand and runs fast and smoothly through quick draws. In addition, MAXIM® PLATINUM® features our unique Warning Track tracer system. The tracer color changes to indicate the mid point of the rope and warns you when reaching the end of your rap by an increasing numbers of red tracers in the last six meters. The middle section of the rope shows a yellow tracer woven into the rope’s pattern. This yellow middle mark helps climbers to easily identify the middle of the rope even in a rope bag. On both ends, the rope incorporates a red tracer that works like a warning light. The number tracer increases over a length of six meters to nearly solid red. This way, the climber is warned when reaching the end of the rap. MAXIM® PLATINUM® features Endura 2x-DRY treatment to add water-repellency to the core and the cover. With minimum water intake, the rope is also UIAA water-repellent. The MAXIM® PLATINUM® is abrasion resistant due to its unique construction. It easily passes the UIAA sharp edge resistant test, and our MAXIM athletes are convinced of its durability and abrasion resistance.